Suprema Lex is a multi-disciplinary, industry-focused Ukrainian law firm consisting of highly— qualified lawyers who work proactively to help their clients reach their business goals and generate commercial advantages. The firm provides a full range of legal services to national and international companies trading in Ukraine and abroad as well as to private individuals. The main principles of the law firm are an individual approach to every client, knowledge of the finest peculiarities of Ukrainian and international legislation, confidentiality and personal responsibility for the services provided. A guarantee of your success in deciding any legal question is the professional competence of specialists to whom you turn. Highly-qualified lawyers and attorneys work at Suprema Lex, who have high-quality legal educations and excellent experience in various branches of law. Suprema Lex offers a full range of legal services and maintains a high reputation for its expertise in a wide array of practices, such as transport law (including aviation law and maritime law), corporate law, taxation, competition & antitrust, M&A, insolvency, dispute resolution, banking & finance law, capital markets, land and real estate law, construction law, intellectual property, branding, licensing, domain disputes, media law, sport law, family law, labor & employment, medical & pharmaceutical law, criminal law, etc. The firm possesses extensive industry-specific experience and consults clients in various market sectors, including agriculture, automotive, aviation, banking and finance, energy, infrastructure and transport, insurance, media and advertising, oil and gas, pharmaceuticals and healthcare, private equity, real estate and construction, retail and consumer goods, telecommunications and IT. Our client portfolio includes international and domestic companies that requires deep expertise and specialized legal advice from legal experts in the above practice areas. 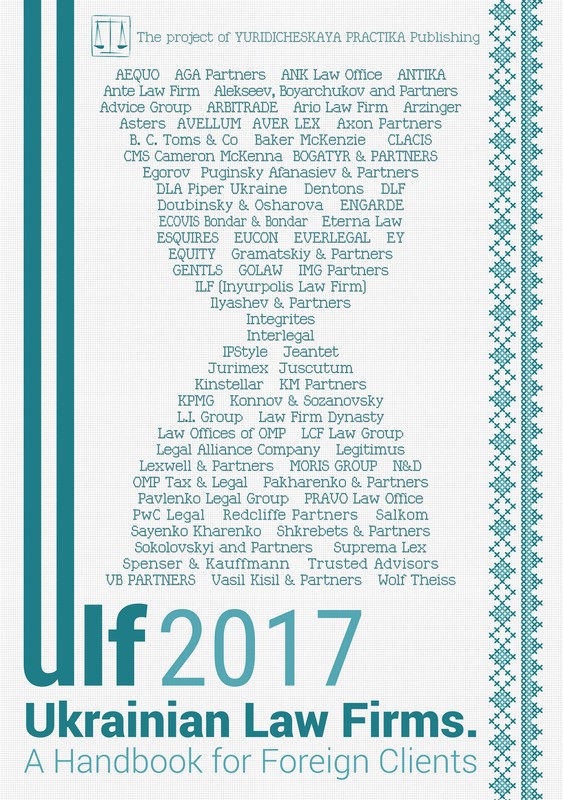 Membership: Ukrainian Bar Association (UBA). — improving the environmental friendliness and energy efficiency of vehicles. In this article we will show the main legal trends and key issues of transportation law in Ukraine, possibilities and risks for international investors desiring to invest their funds into the Ukrainian transport sector. As the transport system of Ukraine consists of several kinds of transport, each of which has certain characteristics, legislation on transport is quite significant in scope and diverse in content. Relations associated with transport activities are regulated by the Constitution of Ukraine, Civil and Commercial Codes, On Transport Act of Ukraine of 10 November 1994, Laws of Ukraine On Pipeline Transport Act of Ukraine of 15 May 1996, On Railway Transport Act of Ukraine of 4 July 1996, On the Transit of Goods Act of Ukraine of 20 October 1999, On the Automobile Transport Act of Ukraine of 5 April 2001, On the Functioning of the Single Transport System in the Special Period Act of Ukraine of 20 October 1998, On the Freight Forwarding Activities Act of Ukraine of 1 July 2004. A significant range of transport relations is governed by transport codes and charters of certain types of transport: Air Code of Ukraine of 19 May 2011, Maritime Code of Ukraine of 23 May 1995, Charter of Inland Water Transport of USSR of 15 October 1955, Charter of Road Transport of Ukrainian USSR of 27 June 1969, the Charter of Railways of Ukraine of 6 April 1998. Among other acts of Ukrainian transport legislation of importance are the rules for transportation of goods, acting for various kinds of transport and all kinds of goods, Aviation rules of Ukraine, regulating the order for acquiring the rights for exploitation of airlines, etc. In inviting potential investors to open dialog and effective cooperation for investing in the infrastructure of Ukraine, the Ministry of Infrastructure of Ukraine really is creating the necessary legislation. But is this legislation really effective for protecting potential investors? Taking into account the considerable number of types of transportation in Ukraine, it would be reasonable to stop at the each of them separately. Increasing passenger turnover, developing the airports infrastructure, making air transportation in Ukraine cheap, comfortable, simple, available and safe are the main goals of reforms of aviation in Ukraine. The indicators of successful implementation of this reform are Ryanair’s anticipated launch, which really can create competition on the airline market and the introduction of the visa-free regime between Ukraine and EU countries. For realization of those initiatives the Ukrainian Government has developed legislative acts on issues of aviation rules that regulate aspects of receiving permits to use airlines; flight and aviation safety; development of airport infrastructure. All of those acts are really necessary for the effective development of aviation in Ukraine, but the wording of legislative acts presented by the Government is not effective enough to protect international investors and so requires further adaptation. The main feature of aviation law in Ukraine is that acts of law are mainly not directly applicable, but based at subordinate legislation. However, due to the basis of Ukrainian aviation legislation meeting international principles and acts it does, in the main, meet EU requirements. The Ukrainian Government has introduced the Concept of State target program of airport development, which is aimed at involving private investments under state guarantees to get reconstruction of aerodromes and terminal complexes of regional airports in Ukraine. Furthermore, the Ukrainian Government is working on the establishment of collaborative airspace with the EU, based on free access to the air carriage market, equal competitive conditions and collaborative rules, especially in the areas of aviation safety, air traffic management, environmental protection and industrial social norms, development of cooperation between air manufacturing complexes of the EU and Ukraine. Analysis of the current state and trends in railway and automobile transport of Ukraine shows that there are several significant problems that need to be solved. This applies in particular to the indeterminate legal status of the state-owned Ukrainian Railways company as the regulatory body of railway transport; the distinction between commercial and Government control functions in rail transport. For the automobile transport, there is a great deal of tension around the issue of financing highways and attracting foreign investment. The technical standards of Ukrainian roads do not meet EU standards nor the quality and weight loads, so Ukraine needs to bring its legislation into line with EU standards. So, amendments have to be made to the On the Public-Private Partnership Act of Ukraine, On Concessions Act of Ukraine. At the end of 2015 amendments were passed to the On Concessions for the Building and Exploitation of Roads Act of Ukraine. Sea and inland water transport are also very popular in Ukraine and play a significant part in the transporting of goods and passengers. An important step in the approach of the transport industry to European standards is interventions to develop a regulations system allocating a part of export goods for the domestic cargo fleet. For this goal it is important to establish national freight exchanges and develop a system of financing national shipbuilding companies and taking into account the importance of improving the quality of agency services to implement minimum requirements for ship agents, based on the recommendations developed by UNCTAD. Ukraine is a participant of the European Agreement on Main Inland Waterways of International Importance (AGN), the European Agreement concerning the International Carriage of Dangerous Goods by Inland Waterways and has introduced the On the Seaports of Ukraine Act of Ukraine that enables Ukraine to be an equal participant of international projects in the area of sea and inland water transportation. The key issues of the transport field in Ukraine are creation of a good environment to provide investment attractiveness, developing public-private partnership, modernization and renewal of rolling stock with the help of finance lease and credit-export financing and engaging investors in improving the condition of the transport infrastructure in Ukraine. So, for the comfort of the transport business in Ukraine, the foreign investor has to acknowledge that Ukrainian transport legislation is now developing and that it does not correspond in full with EU standards. Considering the quality of the Ukrainian court system and imperfections of national legislation for protecting the interests of foreign investors, reform of investment legislation that regulates the activities of the Ukrainian transport market, public-private partnership and capital markets is also necessary. The very serious drawback of Ukrainian legislation in the transport sphere is the lack of a unified approach in questions related to transport activity. If Ukraine is positioning the transport industry as one of the main Ukrainian economic areas then it should follow global trends and develop harmonization with EU standards. The hope is that in the near future Ukraine will get the names of leading countries in the world for investment in transport and infrastructure projects.